How quickly people forget. New York City leaders have been pretty vocal about the Nissan NV200T being the "Taxi of Tomorrow" when, in fact, it isn't much more different in concept than this fuzzy concept from Italdesign and Alfa Romeo. The Taxi of Tomorrow really dates back to the Ford Administration. The Alfa Romeo NYC Taxi was the product of Giorgetto Giugiaro and the New York Museum of Modern Art searching for "realistic solutions" to the taxis of 1976. MOMA produced some requirements for vehicles that were more compact and environmentally friendly. Some American companies produced steam-powered concepts, while Volvo made one powered by something else and Volkswagen tried a hybrid-electric thing. The Alfa was gas, but had a tiny flat four from an Alfasud. Giugiaro's concept is all about space efficiency, which should obviously be the most important thing in a vehicle intended to transport people through a crowded city. It's less than 160 inches long, so like a Ford Fiesta hatchback, yet it had seating for four people in addition to the driver. A Crown Vic is four feet longer, and even the Nissan taxi takes up a foot more space on the road. It could also fit wheelchairs, much earlier than the Nissan taxi could. It also had sliding doors on either side, which was a concept that wouldn't really be adopted by anything until the Nissan Stanza Wagon – and what an awful way to introduce that no-brainer idea to the buying public. There's something really cool about the design, though. Sure, it's upright and looks like the box a GTV6 came in, but it's desperately simple and so functional-looking that you respect it immensely. It's so tiny too for the amount of people it could hold that it still manages to be futuristic. This is a seriously good-looking cab. Sadly, the Alfa taxi was never adopted as anything more than a concept, never adopted in the world. No word if the fact it was an Alfa Romeo weighed on long-term reliability concerns. 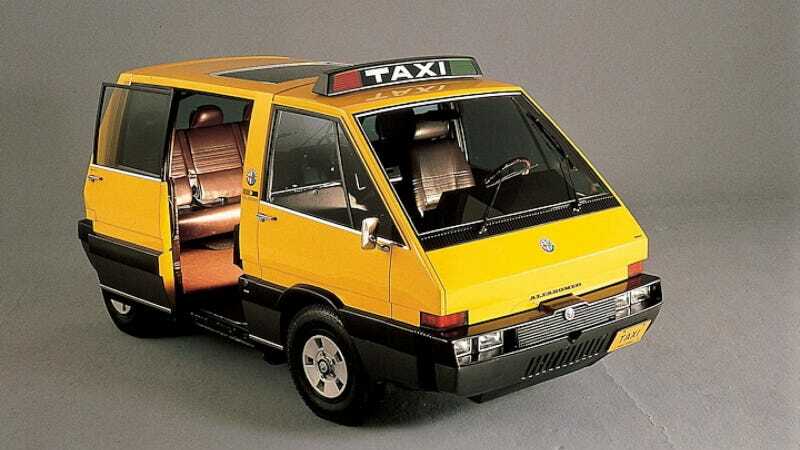 The Alfa taxi concept may not have gone anywhere as a yellow cab, but it definitely influenced the Lancia Megagamma project – a 1978 concept Fiat didn't really have the guts to put into production, yet was adopted by pretty much every company that's made a small minivan. But it proves that Alfa Romeo and Giugiaro effectively predicted the future of taxis 35 years ahead of schedule. And it's so much better to look at than a Nissan van. Check out the Giugiaro site for more photos.